If you’re a dog-lover, chances are you’re already aware of the problems that can arise from a traditional collar and leash set-up. It makes energetic dogs hard to handle, risks chafing and choking, and leaves you nowhere to display important information or store useful items. 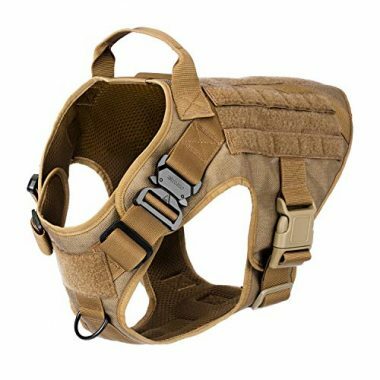 That’s where tactical dog vests come in: these handy devices make handling your dog far easier, let you display patches, and often act as a sort of canine backpack so your dog can carry their own things. Whether you’re looking for a service dog vest or a military dog harness, we’re confident there’s something on our list to meet every need. We’ve also taken the time to answer some common questions about tactical dog vests, so you can rest assured your canine companion is safe and happy during use. 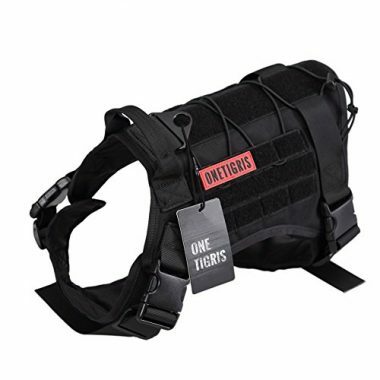 Kicking off our list is OneTigris, with their breathable tactical dog gear. This versatile vest, available in five different colors and three different sizes, features MOLLE straps, which allow you to attach all manner of storage pouches to meet you and your dog’s needs. It’s constructed from 1000 Denier nylon, which is strong, durable, and super light weight. The carefully designed MOLLE dog vest is designed to keep dogs comfortable too, thanks to strategically positioned padding and a soft-cloth covered neck strap. Meanwhile, a wide hook and loop area on the vest offers plenty of space for name tapes or patches. 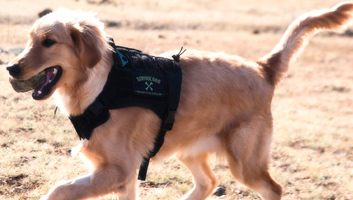 Two handles equipped with metal clips at the front and back make gripping the harness easy, allowing it to function well as a vest for service dogs. The next MOLLE dog harness to earn itself a spot on our list is Ultrafun’s - it’s available in four different colors and three different sizes, so you’re sure to find the perfect fit for pooches great and small. The vest is compatible with all MOLLE pouches, so it’s the perfect option if you have some kicking about from your own gear, and equally useful as a starting point for getting a collection of pouches on the go. Like most tactical dog harness vests, it’s made from strong and lightweight nylon, using quality stitching. Not only is nylon durable and light, it’s also one of the easiest fabrics around to clean, so you won’t need to worry about adventurous canines ruining the vest by splashing around in the mud. It’s easy to put onto your dog too, thanks to three adjustable straps that sit a thorax, abdomen, and chest. This adjustability, along with padding on the chest strap, means you can rest assured your pooch is comfortable while they wear the vest. 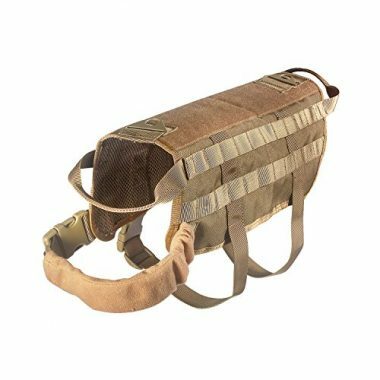 If you’re looking for something a little more compact, we’d recommend Lifeunion’s unique tactical dog harness. Made from high quality 1000 Denier nylon, the vest is tough enough to stand up to whatever your dog’s adventures can throw at it. Adjustable thorax and abdomen straps make for a snug and comfortable fit, while a sturdy handle makes for easy handling. The vest is fitted with velcro on both sides, where patches can be attached. 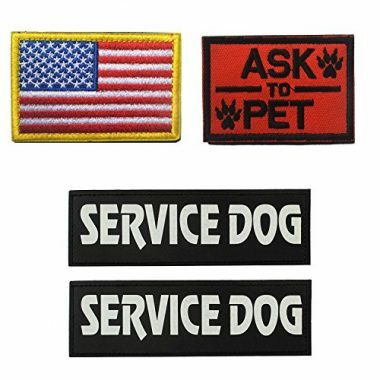 These patches are the perfect way to display vital information, such as indicating that your dog is working. Although you can’t attach pouches to the vest, unlike some of the other options on our list, it works perfectly as a service or police dog harness that won’t weigh down the canine on the job. IceFang are known for working closely with dog trainers and handlers when designing their products, and this k9 dog harness is no exception. This durable vest is made from the strongest nylon on our list so far: it’s 1,050 Denier, water resistant, and breathable. The vest also features soft padding to ensure your pooch is comfortable wearing it even for extended periods of time. The vest is incredibly secure, too - its alloy metal buckle has been tested to withstand loads of up to 1,000 pounds. This impressive strength makes the harness ideal for working dogs on the go. The harness also features MOLLE webbing, so you can mix and match the pouches you attach depending upon your needs. On the front of the harness, which sits over your dog’s chest, is a dedicated area of fabric for attaching patches - great for a name tag, or displaying important information. If you’re looking for strong camouflage potential, look no further than Jasgood’s military dog vest. 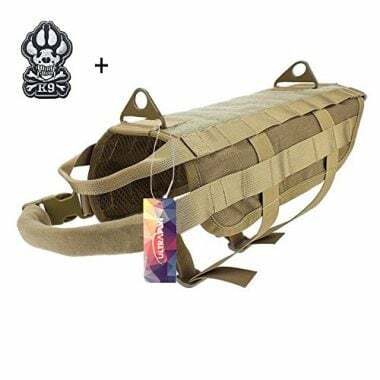 This MOLLE harness comes with three detachable pouches to get you started, which are equally compatible with other MOLLE gear, such as backpacks and belts. The pouches are easy to attach - as is the vest itself, thanks to three adjustable straps. One of these straps - the one that sits across your dog’s chest - is padded to provide maximum comfort. 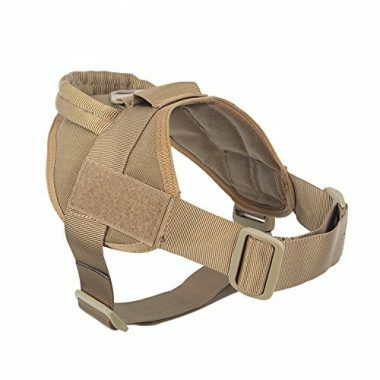 Two strong handles at either end of the harness make handling and lifting dogs easy, so it’s ideal for service or military training. The two metal attachment points beneath these handles are the perfect spot for attaching leads. Velcro areas on top of the harness are great for displaying patches - three of which are included with your purchase. Like most high quality tactical vests, this one is made from nylon (1,000 Denier), to ensure lightness, breathability, and a waterproof finish. Earning themselves a second spot on our list is OneTigris, with their compact and lightweight tactical k9 harness. Available in three different sizes and four color options, the vest is a great fit for all medium and large pooches. The 1,000 Denier nylon of this vest is durable, lightweight, and soft. It’s strategically padded to make it comfortable for dogs to wear even for extended periods of time. Two fully adjustable straps keep the harness from rubbing or riding while in use, while its in-built quick release mechanism make taking the vest off effortless. A handle at the top of the vest makes for easy handling, and beneath this sits a V-ring that’s the perfect place to attach a leash. As well as better handling and a snug comfortable fit, the vest is MOLLE compatible, allowing you to attach pouches or ID panels to meet your individual needs. The next k9 tactical vest to nab a coveted spot on our list is Feliscanis’ offering. 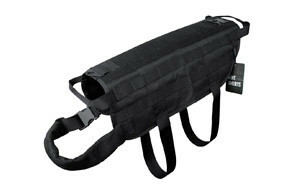 The vest, like most of the high quality options on the market, is made from sturdy but lightweight 1,000 Denier nylon. The vest is designed so as to be breathable, preventing your dog from overheating in the summer months, and also features a well-padded chest strap to prevent chafing in this sensitive area. Each end of the vest features a strong handle, making it easy to handle even larger dogs, and lift them if necessary. These handles are accompanied by metallic attachment points for leashes, or other equipment. 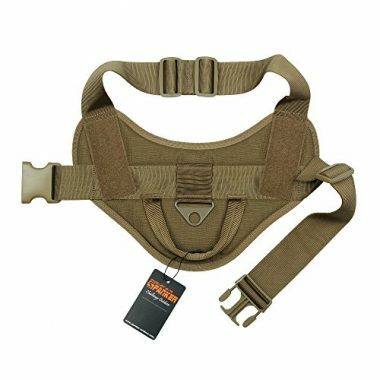 Both sides of the harness feature MOLLE straps, so you can attach whatever combination of pouches meets your needs. Atop the vest, a large velcro surface is ideal for displaying patches, such as ID and other important information. The harness is held in place with three fully adjustable straps, so you’re sure to find a secure and comfortable fit providing you follow Feliscanis’ sizing guide. Perhaps the most compact option on our list is Excellent Elite’s tactical military-style vest. Available in four sizes, ranging from extra small to extra large, this is one of the better options for owners of smaller pooches. The vest’s durable nylon is accompanied by a soft padding that prevents it from chafing against your dog’s hair and skin, and offers a snug fit thanks to two adjustable straps. 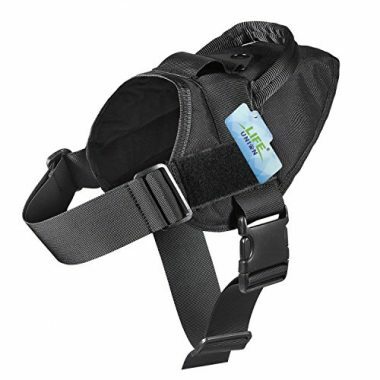 A strong handle and attachment point atop the harness makes handling the dog easy and comfortable, while velcro patches on either side allow you to display patches with vital information. Although this vest doesn't allow your dog to carry supplies, it does provide a much more secure and comfortable handling point than a conventional collar and leash, as well as providing a surface to display important patches. Much like the previous entry on our list, Yisibo’s tactical dog vest doesn’t include space for MOLLE attachments, but it does provide a means of handling your dog that’s far more safe and secure than a typical collar and leash. The 1,000 Denier nylon harness is sturdy and lightweight, featuring soft interior padding and a water resistant coating for maximum comfort and durability. A strong handle that sits on top of the harness is great for convenient handling that won’t risk hurting the dog, while an aluminum alloy ring in the same place is the ideal spot for attaching a leash. On both sides of the harness, you’ll find velcro surfaces, which are the perfect place to attach patches. These patches could proffer identification, or let the public know that your dog is working and shouldn’t be distracted. Throughout this buying guide, we’ve mentioned the importance of patches several times, so thought it would be remiss to finish our top ten list without including some. GrayCell provide a wide variety of velcro patches, including useful messages such as ‘Service Dog’, ‘in training’, and ‘Please don’t pet me I’m working’, in a variety of colors. GrayCell also offer a variety of US flag patches, for those more patriotic pooches! The patches are attached through standard hook and loop (velcro) fastening, or can be sewn on for greater permanence. They’re made from the same durable nylon as tactical vests themselves, so you can rest assured they are unlikely to tear or fade over time. As well as these patches, GrayCell also make a handy saddlebag harness. The harness features two pouches, which sit either side of the dog’s back, and are ideal for stowing canine related equipment on the go. Adjustable straps make the bags comfortable to carry, and stop them from jostling around as your dog moves. 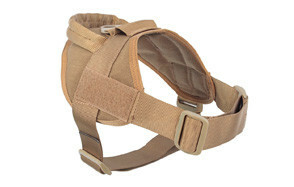 The strap system also features some padding across the dog’s chest and back for comfort and safety. Along with its carrying capabilities, the harness also features a sturdy rubber handle and D-ring leash attachment for easy handling. Finally, the saddlebags come with a useful bonus item; a collapsible silicone water bowl. And there you have it – the best tactical dog vests on the market right now. To help you decide which one might be right for you and your canine, and to help you get the most out of your purchase, we’ve answered some common questions about these handy devices below. The first thing to consider when buying a tactical vest for your dog boils down to a simple question: will it fit? Most vests and harnesses are adjustable, allowing them to fit dogs of all shapes and sizes, but it’s a good idea to measure your pooch and check the manufacturer’s size guide carefully before making a final purchase. If you need your dog to carry supplies, this should be another key concern. Look out for MOLLE compatible vests for the most versatile storage options, but bear in mind that you’ll need to buy the pouches separately. For built-in storage, consider option 10 on our list – the saddlebag style harness. For working dogs, letting the general public know you’re on the job and shouldn’t be distracted is vital. If you need to display patches, look out for harnesses that allow this – they’ll usually have velcro surfaces on their top or side, depending on the shape. Finally, handling is an important consideration when choosing a tactical vest. Most good quality vests feature a sturdy handle or two, and space to attach a leash, giving you great control without hurting the dog. If you suspect you’ll need to lift a larger dog at any point, consider opting for a two handle design for better weight distribution. The name ‘tactical’ stems from this type of vest’s military origins, and refers mainly to MOLLE compatible versions. 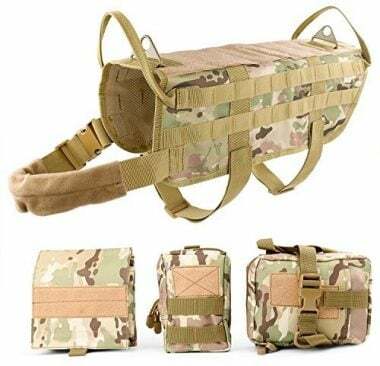 MOLLE vests, whether they’re designed to fit humans or dogs, have the advantage of a modular design, meaning various pouches and other means of storing equipment can be switched out to best fit the circumstances at hand. This versatility means they can be used tactically, unlike other storage solutions. There’s often some confusion in survival and military circles about the difference between MOLLE and PALS, and they’re sometimes used interchangeably – they are certainly connected, but they’re not one and the same. MOLLE – Pronounced like the name ‘Molly’, this acronym stands for Modular Lightweight Load-carrying Equipment. It’s a category of gear – mainly consisting of backpacks, pouches, vests, and belts – developed by Natick Labs, and used by NATO forces including the US Military. 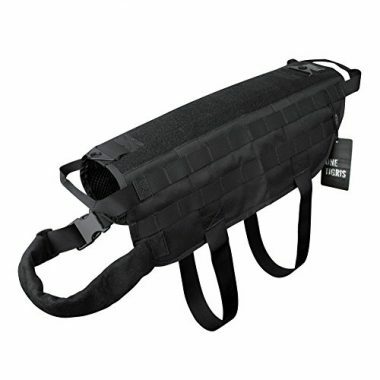 MOLLE equipment can be combined in various ways. If something is said to be MOLLE compatible, this means that other MOLLE items can be connected to it. The system allows for a lot of versatility, as pouches can be rearranged easily. PALS – On the other hand, PALS stands for Pouch Attachment Ladder System. It refers to the webbing system consisting of regularly spaced fabric loops found on MOLLE gear, which allows the modular components to be attached. In other words, MOLLE equipment is attached via PALS webbing. Q: How do I pick the right size tactical harness for my dog? A: Choosing the right size can be a tricky affair, but luckily most manufacturers want to help you out. You’ll likely need to measure your dog’s chest and bust, before checking these sizes against the size ranges offered by the vest maker. Makers usually offer instructions on how to do this. Q: Can my dog get out of the vest? A: Assuming it’s the correct size and the straps are properly adjusted; no. If your dog is trying to escape the harness, though, you should consider introducing them to it more gradually, and double checking that the fit is good. Regularly checking for this proper fit is vital for keeping your dog safe, as well as preventing them from sneaking off. Dr Susan Nelson, a veterinary professor at Kansas State University, advises that when dogs pull on the leash wearing a poorly fitting harness, there’s a potential for chest injury. You should also remember that harnesses can be too tight as well as too loose. You can tell a vest is too tight if it chafes, causes rolls of skin to gather about the dog’s neck, or leaves indentations when it’s removed. Q: How do I clean my dog’s vest? A: Because most vests are made from durable nylon, they’re very easy to clean; simply wipe down, or pop them in the washing machine. It’s important to make sure the vest is fully dry before putting it onto your dog again. This is because wearing a wet harness for long periods of time can cause chafing, or in severe cases, a skin infection. To prevent this, consider removing your dog’s harness if it has been wet for more than a couple of hours, and check hidden areas, such as your dog’s armpits and chest once a twice a week to make sure the vest hasn’t started to rub. 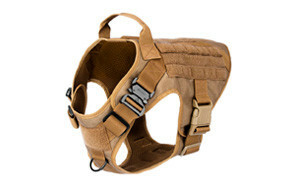 When it comes to tactical dog vests, we give pride of place to OneTigris, for their padded training harness. Its MOLLE compatible design makes carrying exactly what you need a breeze, allowing it to act as a tactical dog backpack. The two strong handles and leash attachment points make the vest a great way to safely and effectively handle dogs, while a velcro surface on its top is perfect for displaying patches. As well as being useful for the owner, the vest is comfortable for the dog. It comes in three different sizes, each of which features a breathable design, strategic padding, and adjustable straps for a truly comfortable fit even during long periods of wear. Made from nylon that’s built to last, the durable but comfortable vest will serve you and your pooch well for many years to come.